For the sixth consecutive year, Mount Sinai will serve as the official medical services provider for the 2018 US Open Tennis Championships. Mount Sinai orthopedic surgeons, sports medicine physicians, and musculoskeletal radiologists will deploy the latest technology and expertise to provide elite athletes with rapid, world-class care. Mount Sinai is also launching an integrated marketing campaign in support of its partnership with the US Open and the USTA Eastern Section. The US Open launch is part of larger umbrella campaign highlighting the full range and scope of services provided by a large, academic health system. The US Open campaign will include billboards; print and digital ads conveying a holistic, whole body approach to treating sports injuries, enabling athletes to spend more time playing the game that they love. Alexis Chiang Colvin, MD, Associate Professor of Sports Medicine in the Leni and Peter W. May Department of Orthopedic Surgery, Icahn School of Medicine at Mount Sinai, and team physician for the U.S. Fed Cup Team, will lead care for the athletes during the US Open, as the Chief Medical Officer of the US Open. "Mount Sinai is proud to be the official medical services provider of the US Open for the sixth consecutive year. Our multidisciplinary sports medicine team provides world class, comprehensive care for these elite athletes. We serve not only the pros, but the juniors and wheelchair athletes as well," says Dr. Colvin. While, officially, the US Open begins on August 27, Arthur Ashe Kids’ Day will kick off the 2018 festivities on Saturday, August 25. A full day of activities is scheduled, including Mount Sinai’s first ever ‘Get Fit and Play’ activation featuring an on-court course of fun physical challenges for youth attendees to participate in. “Promoting the sport of youth tennis as a means to stay fit and healthy is a critical component of our partnership with the USTA. We hope to encourage kids to enjoy the many benefits of being physically active by participating in sports, such as tennis,” says James Gladstone, MD, Chief of the Sports Medicine Service at The Mount Sinai Health System, Associate Professor of Orthopedic Surgery at the Icahn School of Medicine at Mount Sinai, medical director to the U.S. Davis Cup tennis team, and consultant to the US Open. For the first time, Mount Sinai’s Rehabilitative team will host rehab patients at the US Open on Community Day, September 6, to watch the start of the US Open Wheelchair Competition presented by Deloitte. Led by Joseph Herrera, DO, Chairman, Department of Rehabilitation Medicine, and Lucy G. Moses Professor of Rehabilitation Medicine for the Mount Sinai Health System, the team will organize opportunities for patients to meet players as a way to foster a deeper level of connectedness and community among athletes with disabilities. Dr. Herrera will also organize opportunities for wheelchair players to visit patients at Mount Sinai Hospital. 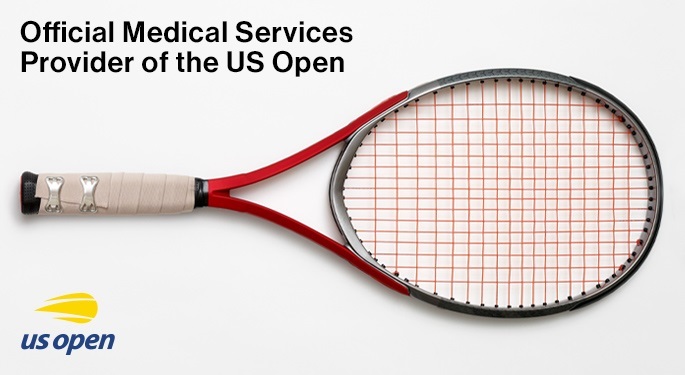 This is the fourth consecutive year that the Department of Radiology at Mount Sinai will offer diagnostic ultrasound examinations to players at the US Open to evaluate musculoskeletal injuries. This group, led by Carlos Benitez, MD, Director of Musculoskeletal Imaging at Mount Sinai West and Mount Sinai St. Luke’s, and Associate Professor of Radiology at the Icahn School of Medicine at Mount Sinai, works closely with the tournament multi-specialty medical team. Mount Sinai radiologists will use the LOGIQ e, a portable, laptop-size ultrasound device made by GE Healthcare. The device has special settings and probes to diagnose musculoskeletal injuries. The ultrasound machine will allow physicians to triage patients at the point of care and recommend more complex imaging techniques depending on the injury’s severity. If treatment is necessary, physicians will be able to do ultrasound-guided injections and aspirations at the stadium. For the third year, Mount Sinai will have a PACS workstation (the Picture Archiving and Communication System, with GE Healthcare software) at the stadium. This workstation has high-resolution, medical-grade monitors and a direct link to the hospital imaging archive. This year, for the first time, the radiology team will have on hand a new portable X-ray machine, GE Optima 200, outfitted with a Konica Minolta Digital Detector that will provide high definition digital images. The device will be used to obtain X-rays of the chest, pelvis, spine or extremities when requested by the tournament doctors. All examinations will be acquired and interpreted by the radiologist at the stadium and discussed directly with the medical team. In addition to providing on-site clinical care for tennis professionals competing in the US Open, Mount Sinai's team of medical experts work year- round to lead the development of policies around injury prevention, community tennis, and diversity, while conducting educational outreach to promote the health benefits of tennis. Additional consultants include: Mount Sinai works with ProHEALTH Care Associates, one of the largest integrated physician group practices in the New York metropolitan area, which has provided medical services at the US Open since 1997. The ProHEALTH team is led by Senior Advisor, Elliot Pellman, MD, the co-founder and Medical Director of ProHEALTH Care Associates, and Clinical Professor of Medicine, Rheumatology, and Orthopedics at Mount Sinai. Click here to learn more about Mount Sinai’s US Open and USTA Eastern Section Partnership.